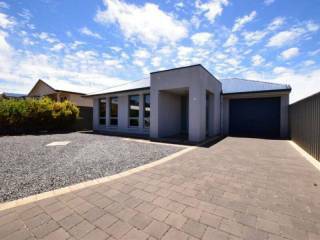 Located a short 5-minute walk to the Port Vincent foreshore, The Loft is a 2-storey holiday house with plenty of space. There are 4 bedrooms – downstairs is a queen, queen, bunk & trio bunk; and a single bed in the upstairs rumpus room/loft – and The Loft can sleep up to 10 people. Quilts, blankets and pillows are provided for guests, but guests will need to bring their own linen and towels with them for their stay. The master queen bedroom has an ensuite bathroom with a shower, spa bath and separate toilet. There is also a main bathroom with bath and shower; plus a separate toilet. The Loft has ducted reverse cycle air-conditioning throughout the downstairs rooms, with a ceiling fan in the master bedroom. The lounge room is spacious with 2 lounge suites, a large television with USB port & a DVD player. There are also board games and DVD’s supplied for guests. The Loft is family friendly holiday accommodation with a high chair and stairgate provided. Upstairs, the loft is a large open space perfect for a retreat, with a television with USB port, DVD player, plenty of seating and a single bed. There is also a reverse cycle split system air-conditioning in the loft. The kitchen is well-equipped with a microwave, dishwasher, electric stove & fridge (with freezer on top). There is also a coffee pod machine (bring your own Nespresso compatible capsules), and a PuraTap water filtration system. A second fridge with freezer for drinks is in the laundry, along with a front load washing machine, iron & ironing board. 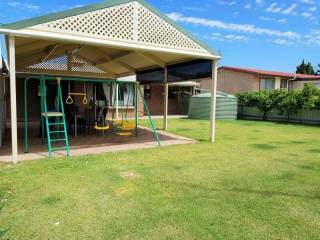 The rear yard is fully enclosed and secure, with a grassed area and fruit trees. There is a large undercover dining area overlooking the rear yard, with a hooded gas barbecue. Parking options are plentiful at The Loft with the double garage accessible to guests for parking cars, and room for another 2 vehicles in the driveway. There is also parking at the rear of the house for 1 car and a boat. Great for a larger family or couples travelling together, The Loft has plenty of space both inside and out.